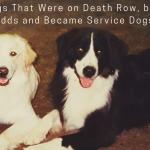 I was sitting on my sofa just last night, trying to explain the importance of crate training to my 8 week Aggression Coaching Class, when I remembered an important story that I thought was relevant. 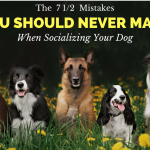 So here I am sharing it briefly to the masses so you, too can understand what your dog may feel like alone and unattended in your home. 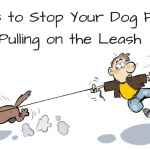 Many dogs get “super” aggressive over their home and territory; especially after their owners leave and this can become a dangerous problem. I once worked with a client who’s Rottweiler would break windows out of their home in an attempt to get at delivery men or anyone who he deemed was “too close” to the family home. He would bark, snarl, lunge at the windows when his owners were home but it was worse when they were gone. Imagine being a UPS man, delivering a package, only to watch in horror as a 150# Rottweiler jumps through a glass window. I can only imagine that PTSD caused that delivery man to quit and find other employment. Thankfully he was fast enough to make a retreat and jump into his truck to drive away before the dog got to him. I am still amazed that the dog in question only received a few scratches. It has been proven that a lot of aggression stems from fear. You know that “fight or flight” feeling that you get when you are afraid of something. It is this instinct that essentially keeps you alive. A lot of animals and people choose “flight” to simply get out of the situation, but some animals choose “fight”. 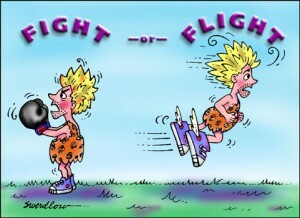 Because, you can “fight” and still have the option of “flight” if things change or don’t go your way. And, the more successful you are at showing defense and “fight” the more apt you are to use it in the future. So your dog thinks he successfully scares away the mail man, UPS, FedEX delivery man, or even people walking past on the street (we know he isn’t scaring them away, unless he is breaking out of the window, but he doesn’t know that) and it conditions him to use aggression as a display to keep people and things away from his space. 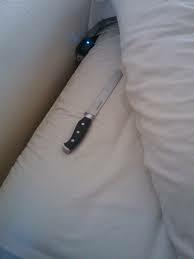 Yes, it’s true; I slept with a knife under my pillow a few times… let me explain. I used to pet sit, and I had one very wealthy client. The house was HUGE many, many bedrooms as well as a theater (yes, with a real movie screen and stadium seating), a pool, a wine room, and all the other amenities that rich people have that I never will ha ha! As you can imagine it was a nice house in a very rich neighborhood and I was pet sitting a Labrador Retriever (about 6 months old) not exactly the vicious guard dog type. I was in my early 20’s, didn’t have a lot of “life” experience and I was nervous when it was time for bed. I locked up the house, checked the windows and doors (admittedly I may have watched a few too many horror films) and still was uncomfortable. In my tiny mind, if a house was going to be broken into, this would be the one. So I decided to sleep with a large kitchen knife under my pillow, for some reason that made me feel a little better; although I still didn’t sleep well. You see I wasn’t nervous in a 2-5 bedroom house, I can handle that… but a mansion that echoed was intimidating. He may even feel this way if you leave him OUTSIDE in your yard!!! If you crate him, he has a small space and can feel comfortable; you take that fear away from him… just like me in a small house. Now put him in a crate and pull the shades and turn up the radio and it can totally squelch his fears because he can’t even see or hear the people that once upset him. Well, it turns out he wasn’t so tough and he didn’t want to be the big bada%$. We got him a crate, played crate games to acclimate him to his new digs, worked on his basic obedience, shut the windows, turned up the tunes when his owner put him in a crate… and his aggression at the window, even when they were home decreased. 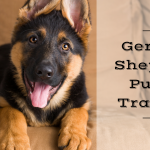 His barking decreased, his lunging and snarling at windows stopped and his owners were able to control him through obedience when they were home. He felt forced to defend his space and was overwhelmed by everything that went on around him. 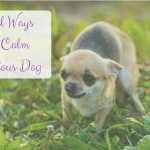 Sometimes just taking the stress out of certain situations lets your dog calm down and not take life so seriously. After all, he would protect his owners if push came to shove the important part was his owner learning some coping mechanisms and control to help calm him. As I write this and get ready to publish I wanted to add that 2 out of 3 of my dogs are happily crating themselves. That means, their crate doors are wide open and they are choosing to lay in there on their own. So for those who think crates are mean, you should speak with my dogs… because they throw fits if they can’t get into their crates. Anything can be abused, but crates are a great tool and a space that is all their own. Shouldn’t we all have a space that is all our own? Absolutely true. I’ve had dogs who would choose to cohabit a crate together (always the same pair), and currently three of our dogs use a room closed off together as a “crate”, because they’re very trustworthy, it’s a contained situation and they’re comfortable. But every single dog (I have seven currently) has been crate trained and all of them LOVE their little rooms. I make them as enticing as possible, mostly use the suspension beds because I have some chewers but a couple can have pillows. They have chew toys, they get treats in their crates and their spaces are always available to them during the day. They go in for naps all the time, with the door left open. I use wire crates only but put them under a table or place a cover over the top so they have a “ceiling”, which seems to keep them more calm.three crates are under my work table, one is in the bedroom with a “roof” on top of which is the dwarf bunny enclosure. I want to say, NONE of them initially wanted a crate – they wanted to run around the house, eat my shoes, toilet in random places, the usual dog desires. They objected. They sounded sad. They complained. Don’t fall for it. It isn’t about the crate, it’s about a bit of doggie rebellion. Once they realize they are in fact going to be trained and be a cooperative household member and good stuff comes out of that, they actually love the crate itself. Dig your heels in, be the person, be willing to get through the difficult moments and you’ll have happy, secure, well trained dogs who love having a space of their own. I think this is such a good idea! To have a “space” of their own is quite important to the dog. There is no abuse in this type of training. If there is no area to breathe, things of this criteria then I will look at Animal Abuse. If the dog is barking, and yell at him to stop the dog will think you are barking with him. Then you yell at the dog to come to you? How is the dog suppose to decide if he has done good or bad? 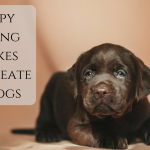 The crate training is a good tool to train your dog that the barking is useless. It starts the social training that it so richly deserves! There is no cruelty what so ever when trying to change the bad habits of a dog! I agree, Minette. Every dog I have ever owned has loved their crates – it is a safety bubble where they can retreat when things get overwhelming for them. I usually start crate training when they first come to us, and it doesn’t take long before the door seldom needs to be closed. They freely choose to go into their crates and willingly spend lots of time in their little sanctuaries. And when they need to be confined (because of illness, travel, or anything else) it doesn’t seem like “punishment”, meaning that the stress of their situation isn’t compounded by being locked into a crate that is strange and unusual to them. They feel safe and cozy. A few months ago, I had taken my dog’s crates outside to clean, and while they were drying, one of my dogs took up residence under and end table that stood between the sofa and a chair. Even when her crate wasn’t available, she instinctively sought out a little den where she could de-stress and feel like there was at least one spot that was quiet and within her control. They love us and they love each other, but there are times when a little solitude is relaxing. And since one of my dogs is aggressive, I find that the ability to confine her when we have visitors is a great way to remove any temptation to bite someone when she feels threatened. It keeps everyone safe. I have a Shepard Husky who also loves his crate and when I leave I turn on the radio (he loves country music) his door is open and he goes right in his crate door open the whole time. I no longer have to close his crate door and I sometimes find him in the basement in his crate sound asleep. I don’t understand is he in his crate? He also has to be taught BEFORE his trigger… for instance give him a command when YOU know the neighbor is coming over but he doesn’t. Work on his down stays or his eye contact and focus while you have someone willing to work with you. I have owned two dogs. both have been crated. The first was a Soft Coated Wheaton Terrier. He loved his crate and at bed time would happily go in to sleep. I have a 5 month old Morkie now. He is also crated when we go away from the house. When he is not feeling well or just tired he will go to his crate and lie down. Both dogs seem to love the security of their little safe environment. Sammie has worked through most of her fear aggression, but I still need to keep an eye on her. She has definite likes and dislikes in people. People she likes, she knows their names immediately, remembers them and is happy to see them. She likes my brother, but not my sister in law…hahahaha. She will bark and then leave. When she doesn’t like someone, I remove Sammie from the room and she goes to her crate. We are moving to Lake Ontario where she will have room to play, swim and be happy. She loves it there. Her next adventure will be kayaking with me in her bright yellow life vest. Samantha is my best buddy. Thank you for all your help and advice. I do not crate my dog. She has two beds, one in each bedroom that she goes into to sleep. Yes she barks at the door when the UPS Fed-x , or anyone comes to the door but after it’s open she goes back to her room. When I am out side she is always near and if a person walks by she will bark but just stand there until they walk on. A cat she will run after but will sit down on the grass she will not go out into the street. Also the cat will just sat in the street and look at her. Everyone around us will just watch. She is only 12 pounds and a great little Havanese She is chip and AKC on all the time . I have had 3 poodles at one time and they were crate trained and I was able to leave the door open for them. They have since passed and I rescued another Bichon/poodle mix but I cannot leave the crate door open for Bennett. He is a severe chewer. So much so that Bennett chewed the underneath lining on my sofa and got stuck between the wooden frame. My husband & I had to flip the sofa in order to get Bennett out. Why am I having so much trouble w/ this little guy when I never had any issues w/ my poodles? When will I be able to leave the crate door open for Bennett? 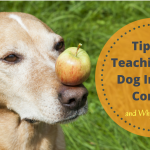 Here is the way I crate trained a hyper 4 year old lab – he had an injury (hip dysplasia) that required a brace and no wrestling with our German shep. Learned this one from the vet. I took a hollow marrow bone (you can buy the hollow ones). I melted some EXTRA SHARP cheddar cheese, stood the bone on it’s side on a plate, poured the cheese in and then put it, uncovered, in the refrigerator. The cheese will dry and shrink. The dog can lap at it for a long time and only get a taste of the cheese. This trick kept the dog busy while I was away. He ONLY got the bone if he was in the crate. He soon lost his reluctance and used his crate a good part of many days – always retreating there when he saw me getting ready to leave the house. Good luck. 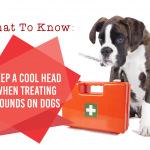 Just also be sure you have a folded blanket or pad in the crate and if you are leaving him for any length of time, include water -use a weighted bowl as it is less apt to turn over. Be sure the crate is big enough for the dog to stand up and turn around. 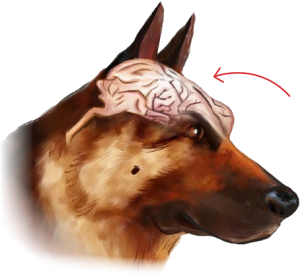 I now have a GSD, was crate trained for 2 yrs with dog shut, now it is open, well he is very aggressive to anyone that comes near his house, or car…just as you described it…he is 4 yrs old now and I am at my wits end. I have several trainers try to train this out of him…NONE HAVE SUCCEEDED. He has been in a crate in car, out of crate…nothing works…if you can cute this problem for me, I would feel you are walking on water. I have started crating him, when i leave, because that is exactly what I was thinking…he has too much territory to protect. My 1 yr old female (Shepherd Mix) matured more quickly than my 4 yr old male (Aussie). The kennel was great for potty training, a safe place when there were thunderstorms and they would run there when I raised my voice (something was chewed and I asked who did this). I’ve placed pet beds/rolls in their prospective places. They are quick to go to kennel or their room when they are told. Yes, a little nervousness from the little one. I don’t let her charge the fence line. I have the male cut her off: she is too young and a voice tone of “Oh Puppy” makes her wiggle all over, I want her to learn from our older dog (alpha), her bark is so frightening that I jump and teaching her to growl in place of the bark. Both dogs are alert and enjoy our yard for playtime. There can be workmen outside with power tools and they’ll investigate then return to me and play. Don’t be fooled they enjoy our time but they have a watchful eye! I have a 2-1/2 yr. old miniature poodle and I wish now that I had crate-trained her but I didn’t know about it when I got her. Is it too late to do it now? If she gets out the gate when someone comes she takes off sniffing at things and ignores commands to come back; often barks at people though she’s not a biter, wants them to play and will run back to get her toy for them. Inside she barks at people walking by or neighbour’s vehicles coming and going – can anyone offer helpful suggestions? She is a very strong willed dog and if I stop her from going outside to bark she mostly still goes out to bark as soon as she’s free! She is quite hyperactive and wears herself out wanting her favourite toy thrown all the time – it’s like a compulsion – will have a sleep then is back to it again! She is very lovable and wants to be with you all the time, I think I’ve spoilt her. Good info except lots of people think a crate for 23 hrs. a day is the way to go. you need to clarify the amount of time a living creature should be crated. You go to a small closet and stay for a day. No water or bathroom. Crates are okay if the person realizes the dog is a living creature and not just a possession or accessory. Don’t promote neglect and cruelty. Thanks for the great info, Minette. I have a border collie mix who is the gentlest boy on walks, at the dog parks, in stores, but at home he turns into a vicious guard dog when a repairman comes in. He loves his crate already, should I crate him and turn on music when the handyman comes in the door? I have been leashing him and keeping him by my side and he seems to calm down after a few hours. He did not like one particular repairman though so I crated him that day. He hates the mailman too! I live alone, so maybe he feels too much responsibility for me? I would keep him with you and teach him if you are home. If you are gone then crate him. If he is with you, make him obey commands. 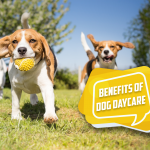 I have a 1-year-old beagle who has used a crated since I got him–about 8 months ago. Generally, he did fine in his crate and, as many have suggested, would go in himself many times. About 2 months ago, I went on an extended trip and was gone for about 3 weeks. While I was gone, a friend kept my beagle. At one point, he put my beagle in his crate and covered it with a blanket to get him to stop barking. Eventually, he did. However, since then my beagle has been reluctant to go into his kennel. Although he doesn’t flat out refuse (i.e. barking, whining, legs in reverse, etc. ), I have to “help” him into his kennel each night. Once in, he has no objections and is patiently waiting for me to open the door the next morning. Any suggestions on how to get him re-acclimated to his kennel (I’m assuming the blanket deal is the issue)? Beagles like food… throw some boiled chicken in there every time you put him in his crate for a month or two, and I bet you will change his mind about going in! As a loving dog mom, of over the years, nine German Shepherds, one St. Bernard, one Rottweiler, and a number of also smaller breeds we rescued and had until old age for them. Wonderful life we did enjoy these dogs. My German Shepherds, never were crated, never even thought of that, every thing was fine! They were in the house dogs. 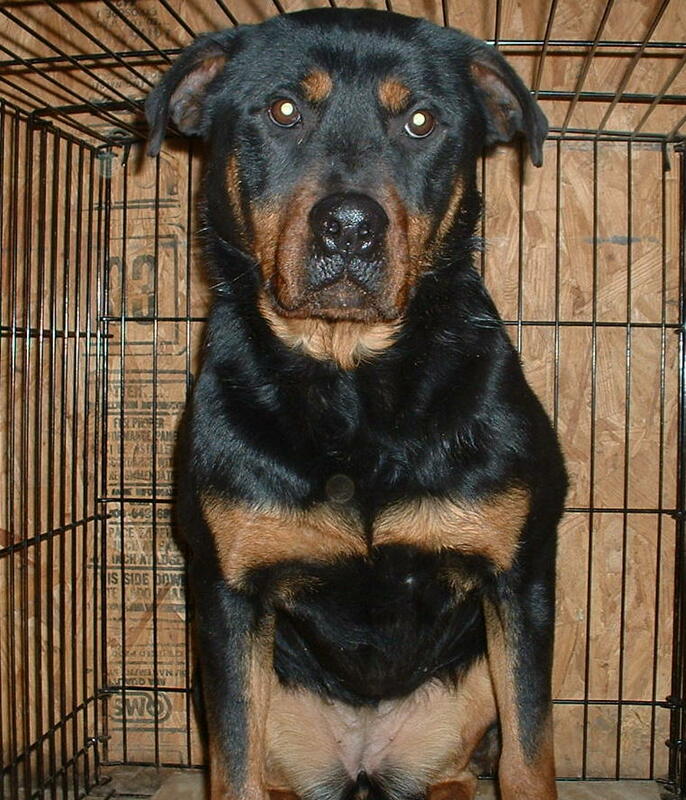 Now with my wonderful female Rottweiler, she was apparently made special in Heaven for me, she started out timid and would cower down in front of men. I got her over that. At nights she saw the kennel as her nightly bed down and her quiet time in the day as she wanted. She was special and great with people!! Special dog. Great with my grandkids! Now, I have a French Herding Sheep dog, and NO kennel suits her. I wish! She will settle after awhile, so after she settles, how long should she be in the kennel? This girl is so different than any of my other large breeds. Hyper, protective, wants to jump up on me, and she has proven to be a great guard dog when I had a break in while home in to my house at night, she did take the guys out, fast! I thought tossing a treat in kennel would get her to enter, NO, did not work, no way could I force her. What now? She won’t be bribed. I began leaving her totally out of her kennel, now, should I begin trying her again using it? She’s rather responsible leaving home alone with my two small dog’s, and not destroying things. She does enjoy grabbing a tea towel off the counter, and running with it. Just one year old now, plenty of puppy in her yet. My dog, still is a lot of puppy in her, is extra large breed, and so different than any other dog’s I’ve had over the years. Help! I am on a learning curve much different then I have experienced. She enjoys people coming in to the home if I invite them in. That’s a plus. I did purchase a kennel for a 125 lb dog. So, she is not crowed in it.